Offer only valid while supplies last. Orders must be completed by 4/18/19 11:59 PM (EST) to qualify. This promotional offer may be modified or terminated at any time without notice. 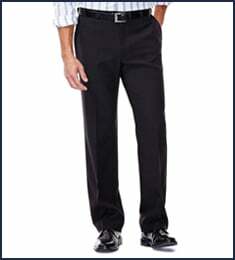 Valid at www.haggar.com. Discount will be automatically applied at checkout with use of code. Not valid on previous purchases. Not valid in exchange for cash, merchandise, or gift card purchases. Promotional pricing applies to US orders only. Don't just feel good in your pants — feel good about them. These stylish slim-fit flat-front chinos with stretch don't just fit well, they fit your lifestyle because each pair is made from recycled water bottles using revolutionary Repreve® fabric. Choose from a family of several smart solid and heathered options. Life Khaki Sustainable Chino is rated 3.8 out of 5 by 41. Rated 5 out of 5 by Jerry MacLean from Awesome! I couldn't be more happy with this transaction with Haggar.com. It was fast, and the pants are as advertised. will not hesitate to do it again, bravo Haggar!!!! Rated 5 out of 5 by Leroys from Love them Love the cut of these. Modern and stylish. They feel great. Rated 5 out of 5 by Islander from Great pants Bought 2 pair. Fit is great, quality is good. Bought 32/32 fit perfectly. Rated 2 out of 5 by Johnny Red from Not like the old ones. These where my favorite pants for years! They were great quality and thickness. They resist stains and I have been ordering them from the web site for years. Now the quality is thin and the size runs a bit small. Sorry to say I sent all of them back. I would pay more to get the good quality ones back. 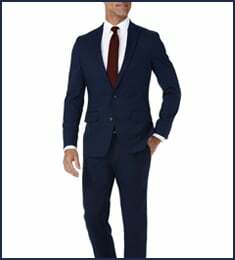 Rated 1 out of 5 by nate130 from Sized small and lower quality materials The pants are sized smaller and the new materials used are definitely lower quality than the original. Rated 5 out of 5 by AnonB4 from Great product! Great fit! I bought two pairs of these about a week to two weeks ago. Absolutely pleased with my purchase. 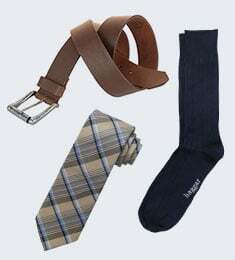 My older son has had several pair & told me to purchase them for my younger son for uniform pants. I have had such a hard time finding something that would fit my younger son that looked good on him. These are perfect & I will be purchasing more!! True to size. 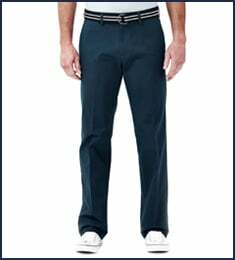 Rated 5 out of 5 by JAB1964 from Love the Sustainable Chino Pretty cool how they incorporate recycled plastic bottle for a percentage of the material in the pant. These are slim fit and I would not say I am slim so I am glad I ordered at inch or two larger in the waist. Great quality. Should last a long time.